I don't think it's quite clear yet if it will be 2 cour or split cour, but 26 episodes is great either way. Good episode, but quite slow in the beginning though, would have been good to see more of Nezuko before her turn, so when Tanjiro was reaching out to her it would have more resonance imo. Especially since she seems all feral now and unable to talk. “Don’t take anyone else from me. I’m begging you not to!” this part was good. 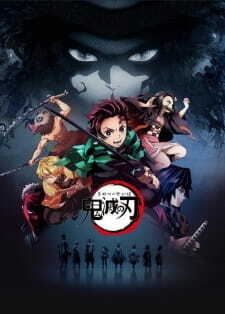 That trick Tanjiro did with the hatchet was pretty slick, interested to see him in action once he gets his katana. The OP had him using this cool ability with ukiyo-e like visuals. Tomioka seems like a swell guy, not too narrow minded in regards to killing demons, urging Tanjiro into action and giving him information on how to proceed going forward. Great Episode.I really liked it,Ufotable is making it so obviously the animation will be good. Also the Ost ,music everything was so good. The OP was so good,we got to see certain techniques of Tanjirou animated(Manga readers know what i mean) and the OP might be the OP of the season. Tanjirou's interaction was good and highly natural in this episode. Erin Read the manga it's great. @Reebi see this series,you will love it. Oh btw Togashi recommended this series. This is one of the series I like this season! I wonder if its possible to cure his sister, or will some demon slayer come along behind the mc's back and eliminate her. no spoilers please. I want to enjoy the tragedy. Good start. Animation looks great, as expected from UFO table. Man, that was awesome! I love the OST and everything was so beautiful! Hopefully the quality will stay like this or better. The OST of this anime is making the show many times better,it was great without it even. The art and animation was great too. The cutest moments were between Tanjirou and Nezuko. Get in the basket Nezuko. Now Sakonji has made an appearance,the training arc begins.This anime is really a contender for AOTY. And the ED was great too. Yeah, I'm really liking what I'm seeing here! I think Dororo does a better job with this genre, but this show isn't really that far off... I'll be watching this all the way through if this keeps up the quality! I actually like this more than Dororo, so far. Like I said in that show's thread I'm more of a Samurai Champloo fan than a Blade of the Immortal fan. Hinging everything on Tanjirou and Nezuko family dynamic is giving is a bit more emotional grounding and that's a hook that gets me in. That said, I'm not willing to stamp it my anime of the year or anything like Juna is. I need to see where this story goes and how the rest of the supporting cast is. It's done what it's done really well so far. But that's as far as I'd go for now. Everything is awesome., even the preview segment. I wasn't too sure about Hanae Natsuki as Tanjirou's VA but he is doing great. Yes, the voice actor is nailing it exactly. Glad for that. Once again peope considering the opening slow... I just don't get it. What do people want these days? If there's action then suddenly it's too confusing for them. So far I'm extremely impressed with everything. Was hoping for some slick looking CGI water breath techniques but the way it looks now is perfectly fine and somehow fits more. Not sure about Zenitsu's lightning breath, though, it looks a bit odd in the OP. But that's just a snippet. And yes, the demons are more vampire-like. But some do eat the whole human for personal preference.